Fun facts about these well-known birds. Three easy-to-follow tips that are sure to help attract cardinals! Energetic and quick, chickadees are fun to watch! Check out these three easy DIY bird feeders you can make in just minutes. Find out what makes suet feeders different (and special). 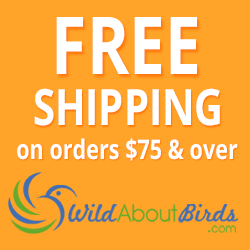 Bird enthusiasts get great enjoyment from seeing our backyard birds feeding and nesting nearby. If you've created a great bird environment with food and water, birds will try to create a nest with easy access to your yard. This can be a wonderful thing to observe. 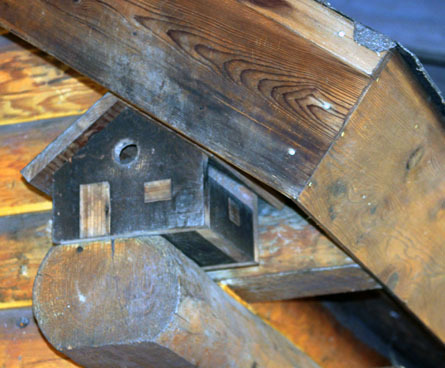 Give birds a safe place to nest by providing lots of birdhouses or nesting platforms in safe locations. Discourage birds from nesting in unsafe or undesirable places by planning ahead. A few simple additions to your yard can make a big difference. Research whether or not you can remove a bird nest that's in a dangerous or hazardous place (when birds are not actively nesting). 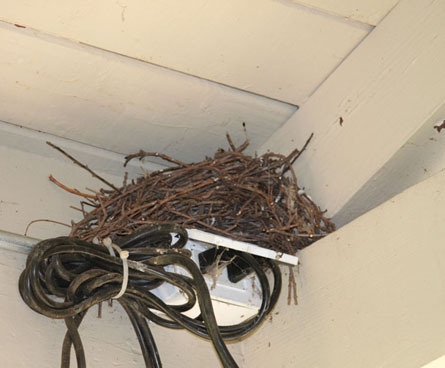 You want to encourage birds to nest in places that are safe for them and often chimneys, barbeque grills, gutters, drain pipes, dryer vents and doorways are not the best choice. These types of locations can be dangerous for birds and their young. While birds may make their nests in many places that are inconvenient, in most cases it's best to leave them where they are. And sometimes... if you can't beat them, join them. If birds are constantly nesting where you don't want them to, try putting up a bird house nearby. Have the eggs already hatched and the brood moved out of the nest? If the nest is empty and the birds have moved on, you can remove the nest. Just be sure that the nest is truly abandoned. The best way to be sure is to watch it over a week or so to see if any birds return. If not, you can remove the nest. Did you find nesting material somewhere you don't want birds to nest? If the bird's nest is not yet complete, you may be able to remove the nesting materials and discourage the birds from coming back. You might even encourage birds to nest in a birdhouse or nesting box you put up nearby. That way the birds have a safe place to nest. Endangered birds are occasionally found breeding in populated areas. As lake front property development continues, birds are being pushed into risky breeding areas that are fraught with dangers from people and pets. If you are lucky enough to have an endangered bird make a nest in your yard, let the authorities know and see if there is anything you can do to help! Imagine how you would feel if you learned that the nest you found on a beach and were worried about being destroyed by the waves was actually the home of an endangered piping plover. Many birds of prey and larger birds will re-use their nest, so it's always best to check with wildlife experts before you act on any nest you find. Native birds' nests are protected and can't be moved if the birds are actively nesting. On the other end of the bird spectrum are birds that are not native to the United States and are considered pests. Their nests can usually be moved without repercussions. European starlings, pigeons and house sparrows often take the resources and nests that native birds need. If they are nesting in an unsafe location, or somewhere you just don't want them to be, in most cases, you can destroy their nests (again, it's always best to check). Like cleaning out a birdhouse, when you are ready to move a bird nest make sure to wear gloves. Birds often have mites in their nests, and you don't want those nasty bugs on you or in your home! Start by checking one last time to make sure the birds are not actively nesting. If there are eggs, chicks or brooding adults in the nest you will need to make sure that they move on before removing the nest. When in doubt – wait a week or two. Most bird eggs hatch in a couple of weeks and fledglings will often be ready to leave the nest a few days or weeks, so you won't have too long to wait. Once you have removed a nest, take steps to avoid having future nests built in that location. You may wonder if fake owls can be used as a deterrent to keep birds away from areas you want to keep bird free. In most cases, even when owls are hung by fishing line (which makes them less stationery) the birds will get accustomed to their presence. Hanging owls up is not a great way to keep birds from nesting where you don't want them. Wind chimes create a similar sense of motion and add a layer of sound that may discourage birds from nesting nearby. Wind chimes also have the added benefit of being a pleasant addition to your outdoor living environment, as many people really enjoy the sweet sounds that wind chimes create. An owl-shaped wind chime is fun nod to the myth that owls scare off birds, and is a great addition to many yards. Flags create a sense of motion, which can often deter birds. Birds look for a safe place to make a nest and flags that whip in the wind may be just the deterrent you need to keep birds away from unsafe nesting areas. Bird nets, often used to keep birds away from fruit trees, can be a great way to keep unwanted birds from nesting under eaves or other locations on your house. These nets are easy to cut into the desired size, often are not noticeable to people at a distance, and are an inexpensive way to encourage birds to choose more suitable nesting locations. A motion-sensitive strobe light or audio player (like you find at Halloween) can be a great way to deter birds without adding a huge visual element to your house or yard. By activating when the birds approach, a motion-sensitive deterrent can scare birds off before they get comfortable. Remember that birds are intelligent and will often adapt to changing environments, so you may need to try one or more of these suggestions to keep birds from nesting in unwanted and unsafe locations. Different birds respond to different stimuli, so try a couple of different things until you find something that works. 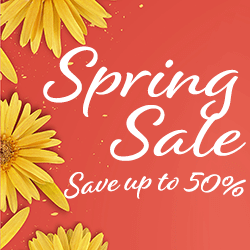 Ideally you can find a way to make your yard a safe place for birds to nest. Photo Credit: Bird houses by alisbalb2 via Depositphotos.com. cc. All other photos by WildAboutBirds.com photographer Judy_NMMI. Reference: Wood, T., Williamson, S., and Glassberg, J. 2005. Birds of North America. Sterling Publishing, New York.